I visited a coworker in the hospital this weekend. He told me he was at home watching tv when the doorbell rang. When he opened the door, there was a 6 foot cockroach standing there. Before he could say anything, the cockroach punched in the stomach and ran off. The next night, he was sitting at home again. The doorbell rang. There was the 6 foot cockroach again. This time it punched him in the stomach and the karate-kicked him before running off. The third night when the doorbell rang, my friend was a little more cautious. He cracked the door to peek out, and there was the six foot cockroach again. The cockroach kicked the door into his face so hard he saw stars. Then the cockroach came in and jumped on him and kicked several times so hard he nearly lost consciousness. He dragged himself over to the phone and called 9-1-1. There are a lot of nasty bugs going around, from the H1N1 swine flu to job losses to the price of gas. It shouldn’t surprise you that “nasty bugs” have been part of our existence for thousands of years. Today, we’re going to look at Psalm 62 and see how David deals with one of life’s turn of events. David has several more children over the years, but the sword never leaves his house. As his children grow, David has to deal with children that are disrespectful to him. His son, Absalom, claims the throne for himself. David, not willing to fight his own son for the throne, flees to the desert. A very stressful time in David’s life, losing your job to your son who’s trying to killing you. My day doesn’t seem so bad. And it is this time in David’s life that he pens Psalm 62 and gives us instruction for how to deal with life’s nasty bugs. David’s strength comes not from his position as king or from wealth or from power, but in the Lord. •	God is my rock. What images does this bring to mind? What qualities of a rock provide security? •	God is my salvation. If God is our salvation, why does that give us security? •	God is my fortress. What images of security does a fortress bring? Our security is attacked many ways. Job loss, personal conflicts with others, sometimes with many others. Satan does not want you to have security and will deceive you that your security is misplaced. He wants to topple you. And he will keep this up for an unfairly long time – “How long” will he assault a man. •	What sort of things threaten our security and make us feel unsafe? The Lord God is still our rock, our salvation, and fortress. The Lord is also described as a refuge. Like a fortress, we can run to the Lord for safety when we feel threatened. David reminds the people of Israel that the Lord is not just a fortress of safety for him, but for all people. We can trust in Him. More than that, verse 8 says that I can also pour out my heart to God. God knows our thoughts and feelings, he knows our pain, our hopes and desires. When we are in need, in trouble, in fear, trust in Him at all times and pour out your fears to Him. We have security in God because He tells us so. And if God is for us, who can be against us? •	In relationships. What sort of relationships do we try to find security in? •	In what ways can these relationships fail us? •	David also cautions us against placing our faith in things, especially ill-gotten gains. What sort of things do we use to seek security? •	In what ways can things fail us? •	Why are we tempted to add other forms of security like wealth or relationships, rather than rely on Christ alone? Jesus, of course, knew all this. There is no security anywhere but God. Matthew 6:19, “Do not store up for yourselves treasures on earth, where moth and rust destroy, where thieves break in and steal.” Instead, we can trust in God because of who He is. He is unique, one of a kind. Let’s look at the final two verses of Psalm 62. •	What are some of the attributes of God that give us security in Him? God knows we have fears and concerns about our security. He is training us for something better, something that requires us to learn to trust in Him. If God is so powerful, why is it that we are scared? Is God really in control? That’s what we ask ourselves, and what God wants us to know, even when we don’t see Him at work. It’s precisely at those times God is at work in us. Last week, Michelle taught from Isaiah 6. This week, the lesson covers Isaiah 7-23. When I first started studying, I though, whoa, we’re supposed to cover 16 chapters? I spoke to Fred about this last Saturday; he said there was no problem covering all 16 chapters, he would enjoy a thorough lesson. So I thought we’d cover chapters 7-10 first, then break for lunch. Come back and read chapters 11-20 and then break for dinner. That would leave us plenty of time to cover 21-23 this evening. Actually, I’ve noticed that the bible is an amazing book in that the closer or further away you get, there are different lessons. Isaiah 7-23 has many, many lessons for us. Isaiah 7-12 is a warning to political leaders; chapter 7 talks about hope, chapter 8 is a warning of judgment, 9 is a promise of mercy, and so on. Chapters 13-23 are prophecy and fulfilled prophecy, showing that the Lord is in control. Yet we can also focus on a single sentence and get a life-changing lesson from it, the Word of God is that powerful. We’re just going to focus on Chapter 7 this morning. In Chapter 7, Isaiah reminds us that we are to trust in God in times of stress. We are God’s people, and we are to do things God way. God’s will be done; we can participate, or God will do His will without us. Yet, stubborn as we are, we often choose to be controlled by our circumstances rather than listen to the Lord. And that’s the lesson from the Lord today – to have faith in Him and not things of the world. It’s time to make a decision. You can go one way, or you can go another. You can ask for help, you can go it alone. You can help a friend, but it means breaking a confidence. You can accept a new job, but it means moving away from church. What are some difficult decisions we face today, as a nation, as a church, as a class, or as a family? On Nov. 24, 2008, Los Angeles City College speech professor John Matteson reportedly interrupted and ended Jonathan Lopez’s presentation mid-speech and called the student a derogatory name in front of the class for speaking about his faith, which included reading the dictionary definition of marriage and reciting two Bible verses. One week later, after seeing Lopez talking to the college’s dean of academic affairs, Matteson told Lopez that he would make sure he’d be expelled from school. What are Mr. Lopez’s options? How would you respond? In Isaiah 7, King Ahaz is faced with a similar dilemma. He’s faced with a threat and has to make a decision. David’s kingdom had long since split in two after the death of Solomon. Israel to the north had routinely strayed from the lord. Judah to the south, sometimes followed the Lord and sometimes they didn’t, depending on the king at the time. Northeast of Israel was the nation of Aram (also called Syria), and north of that was the rising Assyrian Empire. Under King Uzziah, Judah flourished. Aram and Israel had wanted to form an alliance with Judah, but Uzziah had resisted. Isaiah preached that the Lord would save, and Judah should remain neutral. Uzziah was dealing with raids from the Philistines from the west and the Edomites to the south, and if Uzziah moved troops to face the Assyrians, the southern attacks would succeed. Uzziah stayed neutral, and under King Uzziah, Judah flourished. Uzziah died, and his son Jotham took over. Jotham was also a strong leader and kept Judah neutral, but died young. And Ahaz, 20 years old, took over. It’s now about 735 B.C. Isaiah also spoke to Ahaz about relying on the Lord to save, but Ahaz didn’t listen. Ahaz was not a righteous king; in 2 Kings 16:2-3 we’re told Ahaz offered sacrifices to Baal and pagan idols. As a weak king, Israel and Aram gave up on the alliance idea and decided to attack Judah. Their goal was turn Judah into a puppet kingdom and become large enough to defend themselves against the Assyrians. Isaiah brings Ahaz a message to depend on the Lord and remain neutral. Isaiah tells Ahaz that Israel and Aram are too weak to be a threat, and that the Lord will protect Judah. Instead, 2 Kings 16:8 says Ahaz gave away treasure from the temple of the Lord to the Assyrians as a bribe to protect him from Aram and Israel. Instead of listening to Isaiah’s word from the Lord, Ahaz tried to appease evil. How well did this work out? Assyria used the treasure to finance the war to conquer Aram and Israel, and then in 2 Chronicles 28 we’re told the Assyrians continued their march and conquered Judah, too, with the help of the Edomites from the south. Isaiah told Ahaz to trust in the Lord. As Christians, we’re also taught to trust in the Lord. Like Ahaz, though, we attempt to resolve problems using our own human strength. Ahaz made several mistakes we can learn from. Let’s look at Isaiah 7:1-2. When Ahaz son of Jotham, the son of Uzziah, was king of Judah, King Rezin of Aram and Pekah son of Remaliah king of Israel marched up to fight against Jerusalem, but they could not overpower it. Now the house of David was told, “Aram has allied itself with Ephraim”; so the hearts of Ahaz and his people were shaken, as the trees of the forest are shaken by the wind. Ephraim was the largest of the ten northern kingdom, and is used here to represent all of Israel being united. Ahaz gets word that Israel and Aram have become allies, and Ahaz is scared, shaken by the wind. Ahaz has been given the word of the Lord, but he fears men. He has misplaced focus. Oswald Chamber wrote, “The remarkable thing about fearing God is that when you fear God you fear nothing else, whereas if you do not fear God you fear everything else.” We face many fears in a world of sin and uncertainty. Finances, disease, natural disasters. We may face danger. We may face fear that someone we love will be hurt. Something may challenge our emotional or spiritual strength. We are tempted to give in to fear, to find a worldly solution. Our focus should be on the Lord. What would the Lord have me do in this situation? How do I obey His commands in this time of trouble? When we turn to the Lord, fear of the world is replaced by faith in a faithful God. Our God is a powerful God. Why should we fear anything else? In Matthew 6:25-34, Jesus teaches us to remember that the Lord knows our needs, that He will take care of us. Do not worry about what we eat or drink, or what we should wear. Put the Lord first, and He will provide what we need. What was Ahaz’s fear? Was his fear justified? Have you ever been in a circumstance where you were afraid? Have you ever asked for someone’s advice and wish you hadn’t? At what point did you turn from your fears and turn toward the Lord for strength? The Lord says to Ahaz that the attack from the north will be unsuccessful. The leaders of those countries are only men, and He is the Lord God. The Lord knows the plans of evil men, and the Lord tells Ahaz that He is in control. The Lord says that these two countries are like sticks that have burned up, and there’s nothing left of them. Their flame may have once been bright, but now they’re dying. Both kings would be dead within two years. Isaiah’s specific prophecy was that within 65 years, Israel would be too shattered to be a people. In 722 BC, Assyria conquered Israel and deported the people. 2 Kings 17:24 says foreigners came into the land to replace them, and Ezra 4:10 says later even more foreigners arrived. Ahaz had misplaced confidence. His confidence is in himself. Ahaz puts his trust in a political alliance with Assyria. God is with Judah, but only if Judah is with God. Ahaz is trusting in the strength of an enemy to save him from other enemies. Where is Ahaz’s faith in God? If we do not place our faith in the Lord when times are tough, then we have no faith at all. That’s what the Lord says – if you do not stand firm in your faith, you will not stand at all. But God is infinitely stronger than any problem we face. He is aware of our needs, and He is aware of those that plot against us. And God will help, but we must place our faith in Him first. Our primary confidence must be in Him, not ourselves, not other people, not worldly wisdom. God allows us to be tested in order to increase our faith in Him, and we demonstrate that faith when we give Him control and do not worry. 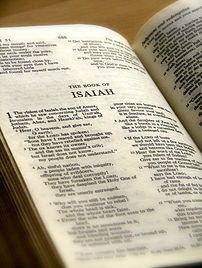 I notice also that Isaiah the prophet is faithful to share God’s word. But I also note fulfillment of prophecy that Michelle taught last week in Isaiah 6. Isaiah’s message falls on deaf ears, and Isaiah’s vision is unintelligible to blind eyes. Why is Ahaz’s response wrong, but Jesus’ response was right? Ahaz was exhibiting false religiousity. Ahaz wasn’t testing the Lord; the Lord was testing Ahaz. Ahaz was twenty years old when he became king, and he reigned in Jerusalem sixteen years. Unlike David his father, he did not do what was right in the eyes of the LORD. He walked in the ways of the kings of Israel and also made cast idols for worshiping the Baals. He burned sacrifices in the Valley of Ben Hinnom and sacrificed his sons in the fire, following the detestable ways of the nations the LORD had driven out before the Israelites. He offered sacrifices and burned incense at the high places, on the hilltops and under every spreading tree. The Lord commanded Ahaz to ask for a sign. Ahaz refused. Ironically, Ahaz probably had been asking for signs from Baal and other deities; the Lord God says, “ask for a sign from me.” When Ahaz said he wasn’t going to test the Lord, what he was really saying was that he wasn’t going to trust the Lord. Ahaz used scripture to keep from obeying the Lord; he had missing integrity. While calling for Isaiah’s counsel, Ahaz had no faith in the Lord. To ask for such a sign from God required a faith from Ahaz that he didn’t have. He gave the appearance of being a religious person, but he was willing to sacrifice to idols, sacrifice his sons, make political alliances with enemies, anything at all. He had no integrity. Integrity is the opposite of hypocrisy. Hypocrisy is saying you believe or feel one thing, but then do something else. You are two different people; you do not practice what you preach. Integrity is being one person. You are the same person on the outside as you are on the inside. When we are a hypocrite, we are not being honest with God. We’re not even being honest with ourselves. Then Isaiah said, “Hear now, you house of David! Is it not enough to try the patience of men? Will you try the patience of my God also? Therefore the Lord himself will give you a sign: The virgin will be with child and will give birth to a son, and will call him Immanuel. Through Isaiah, God challenged Ahaz to ask for a sign, but Ahaz refused. Pious, fake religiosity; Ahaz refused to test God. In truth, Ahaz didn’t want a sign from God, because then Ahaz would have to be obedient to God or expose his own hypocrisy. Ahaz had already decided to place his faith in men; Ahaz had already requested help from Assyria. God’s answer is to the entire house of David. Notice also that Isaiah refers to “my God,” perhaps recognizing that Isaiah’s God is not Ahaz’s god. God provided a sign anyway, even though Ahaz would not ask. God’s ultimate sign of His authority will be His Son, Jesus. The Hebrew word for virgin is complex; for Isaiah’s time, it probably means, “young woman of marriageable age.” In the next chapter, Isaiah chapter 8, Isaiah is talking about his own child, Maher Shalal Hash Baz, which meant “Quick to the plunder, swift to the spoil.” Partial fulfillment of this prophecy meant that Assyria would plunder the Aram and Israel before the child was old enough to know right from wrong. We know there’s more to the prophecy, though. There is partial immediate fulfillment, but there is eventually ultimate fulfillment. Isaiah’s wife, the prophetess, was probably a real nice lady, but she wasn’t a virgin. She and Isaiah already had one child together. Also, Isaiah’s prophecy is not given to Ahaz, but the House of David, and he uses the plural “you”. The literal and ultimate fulfillment of this prophecy is in our Lord Jesus in Bethlehem. The apostle Matthew 1:22 says that “All this took place to fulfill what the Lord had said through the prophet: ‘The virgin will be with child and will give birth to a son, and will call his name Immanuel, which means ‘God with us.”” The Greek word used here is not ambiguous; it means virgin, a woman who has never had sexual relations. Our faith should be in the Lord, not in people, places or things. In 2 Samuel 7:16, the house of David was assured that David’s house and kingdom would endure forever, yet Ahaz placed no faith in that promise. God teaches us through trials to trust in Him and Him alone. God will work out His plan, whether we participate in His plan or not. Ahaz certainly didn’t; Ahaz had faith in himself and in the world, and placed no faith in the Lord. As a result, Judah eventually fell and was plundered by the Assyrians. But look at Matthew 1:9 at the genealogy of our savior. The lineage of Jesus begins with Abraham through the line of David, then through Uzziah, Jotham, and Ahaz. God provided a savior; God fulfilled prophecy. God is faithful, even when we are not. When a crisis comes, don’t misplace your faith; learn to place your faith in God. Don’t misplace your confidence; our God is bigger than any crisis that comes. Be honest with the Lord, ourselves, and other; when we respond in faith, it pleases the Lord and encourages others when they see how the Lord responds in our lives. If we do not stand firm in our faith, we will not stand at all.